In August of 1976 Elvis flew back out to the west coast. He still owned the house in Palm Springs, the one fans refer to as the Honeymoon House. 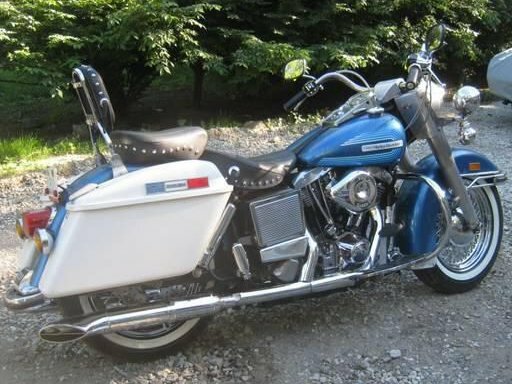 On the 11th he bought another Harley, this being a 1976 Harley-Davidson FLH 1200 Electra-Glide. This FLH was dressed like all his others, save for the Liberator, but at some point this bike was custom (re) painted. 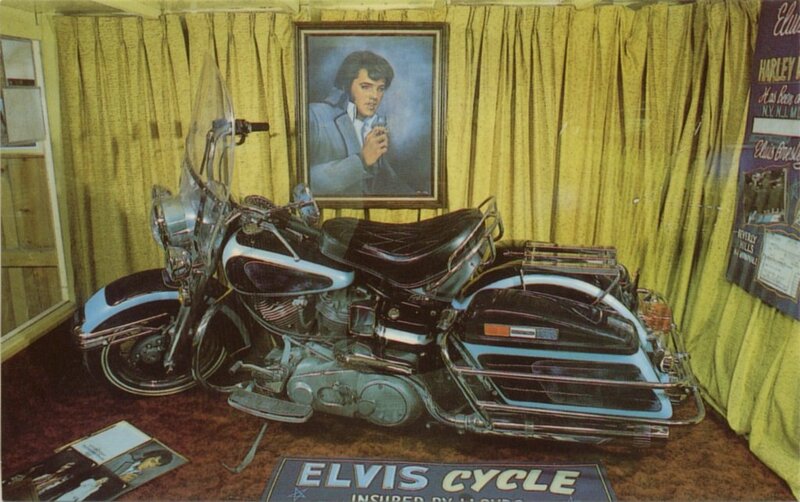 It is not a standard H-D scheme but could possibly have been painted at the same time as another in the collection at Graceland with a similar scheme. 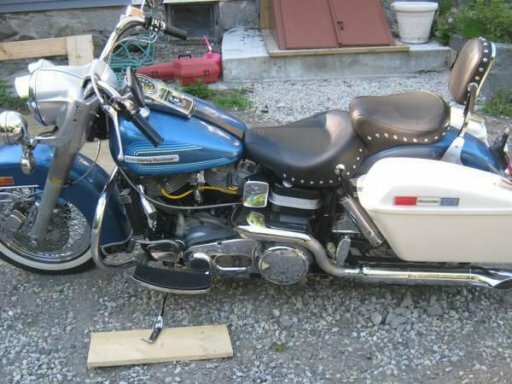 In 1976 the colors available from Harley were Birch White, Black, Chestnut Brown, Sequin Black Metallic (as used on the Liberty Edition), Vivid Blue, Vivid brown, Vivid Red and Champagne Silver Metallic. There are no pictures of him known on it and how it left his ownership or estate is not yet clear but there is a valid paper trace and history. 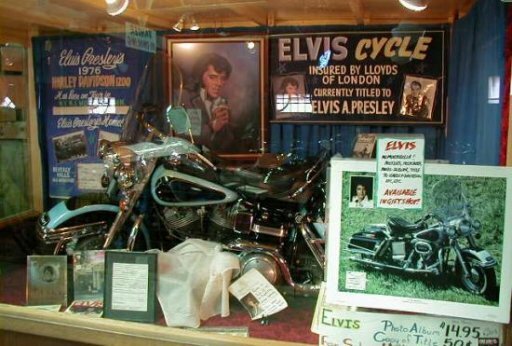 After Elvis' death it was owned by a hotel owner in Wildwood, New Jersey who used it as a showpiece on display. Around 1983 it was purchased by Tony Rakowski from Frankfort IN. Tony had started in the Classic Car business in 1976 dealing primarily in vintage Thunderbirds. He first saw the Harley in an auction in Las Vegas, he thinks one of the Dan Kruse shows, but it received no bids. Talking with its owner, he got the VIN and contacted the Division of Motor Vehicles in Sacramento, California to confirm with them the legitimacy of the title and who the original owner was. Satisfied of its authenticity, he then traded a 1957 Thunderbird for the motorcycle even, one which he had about $25K invested in. 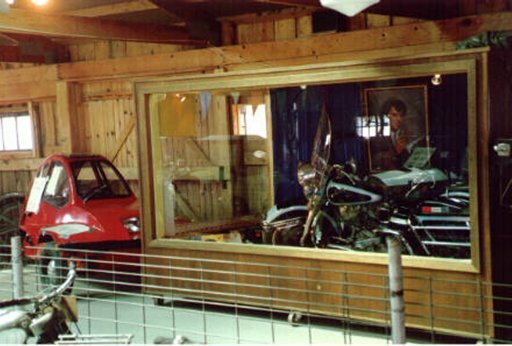 The trade included the display case the New Jersey owner used to display it. He then showed the car in several places, arranging with Kruse to waive the fee of bringing cars to the auction if he brought the motorcycle to showcase for the advertising benefits. He didn't own it long until it was seen at one show in Wisconsin by Dave Geisler, who with his family has owned and operated the Pioneer Auto Museum in Murdo, South Dakota since 1954. Tony offered to sell it for $30K but Dave counter offered with a trade for any car of his choice in his museum (save one). Back in Murdo Tony perused Dave's collection and settled on an un-restored 1932 Packard 4-door convertible, which he later sold for $54K, content with the return on his investement. 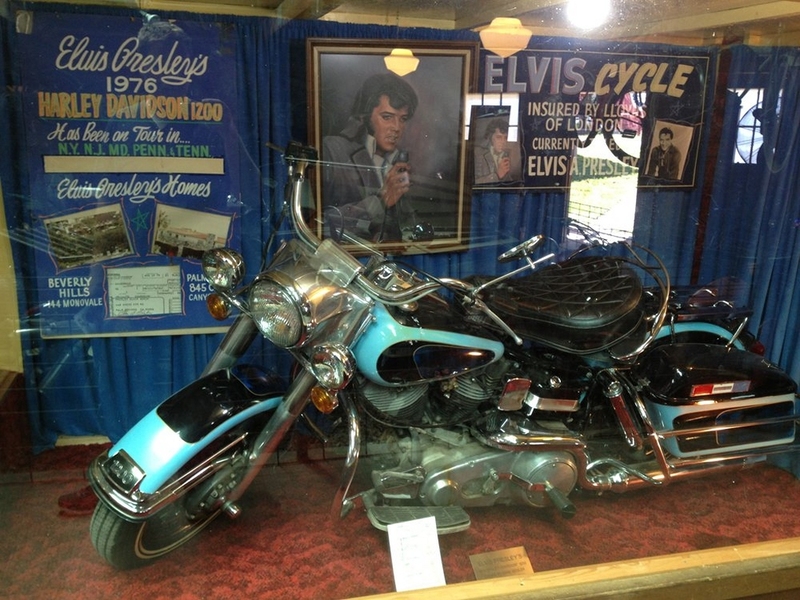 Dave has had the motorcycle on display since at the Pioneer Auto Show, where he also sells copies of the original title and post cards featuring the motorcycle. You'll note the misspelling of Elvis' middle name on the title, "Aeron" instead of "Aaron" (a common affliction in Elvis lore). The VIN of 2A43580H6 decodes as 2A=FLH, 43,580 in sequence, H=7 (decade), 6 being the model year (1976). The title was issued on September 14th of that year. Today, with only about 1200 original miles on the speedometer, it is a popular attraction there and over the years Dave has been approached by several auction companies wanting to put it up. He was even offered $350K from a collector. As yet he's not interested in parting with it and for the foreseeable future at least it will remain in Murdo, in the original display case and dressing from Wildwood, NJ. Its the only vehicle in over 250 at the museum you can't touch. Special Thanks to Dave Geisler and Tony Rakowski for their help with this page.